Last weekend, I woke up thinking about waffles. What I really wanted was a fluffy buttermilk waffle, with crisp, buttery edges, and dripping with maple syrup. The kind of waffle that's really just dessert for breakfast. But instead I mixed up a waffle batter that I would feel good about having, with nutritious oats, whole wheat flour and almond milk, some vanilla and cinnamon and lots of blueberries. I won't pretend that these were anything close to the decadent breakfast I would have liked to have instead, because honestly, it's the fat in butter that gives waffles their lovely crispyness, and without that, it's just not quite the same. Not to mention the fact that these were barely sweetened. When I make these again, I might try adding a little coconut oil for some richness, and see if it also adds the crispyness that butter would have. Protein powder could probably be substituted for some of the flour as well. However, that said, they were hearty and perfectly satisfactory, especially with all those juicy blueberries delivering pops of sweetness throughout. That morning I also warmed up a bowl of blueberries, then stirred in a spoonful of sour cream and some honey, and the cream turned such a pretty lavender color from the berries. 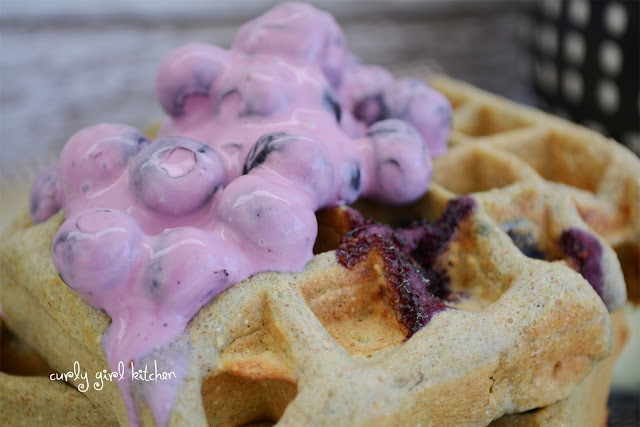 We spooned the lavender berries and sour cream onto our waffles, and I almost forgot about the maple syrup I would have liked to pour over my plate until it pooled into every little bit of the waffles. I froze the leftovers so I could toast them later, and I think I liked them even better that way, spread with a little natural peanut butter. Note: With no oil or butter in the batter, these waffles are a little on the dry side, but I wanted to avoid drenching them with oil, butter and syrup. The leftovers are fantastic frozen, then toasted and spread with natural peanut butter. If you like, you can add some melted butter, vegetable oil or coconut oil for a more moist waffle; you may need to decrease the milk a little if you do. 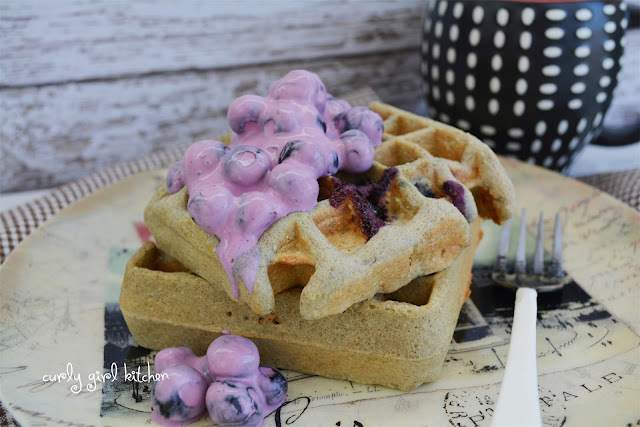 In a blender, combine all of the waffle batter ingredients, except the blueberries. Blend until smooth. Pour into a bowl and stir in the blueberries. 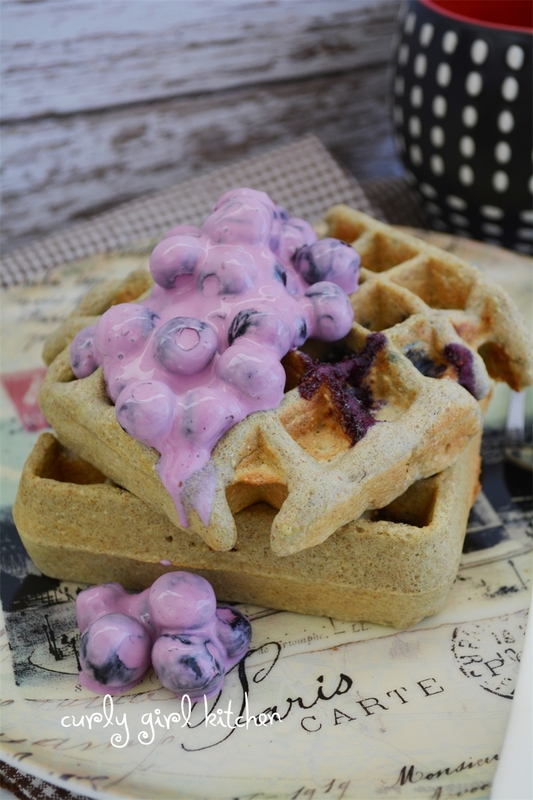 Heat your waffle iron, spray with non-stick spray and cook the waffles, using about 1/2 - 2/3 cup batter for each waffle, although this will depend on the size of your waffle iron. Meanwhile, place two cups frozen blueberries in a bowl and microwave for 30-45 seconds to warm them up. Stir in the sour cream and honey. Serve on top of the waffles. 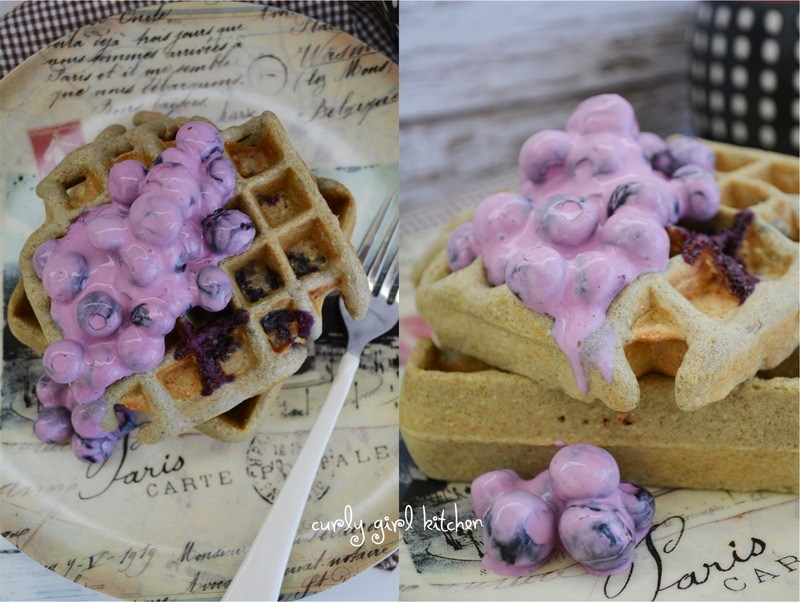 These are hearty, and one waffle is very filling. 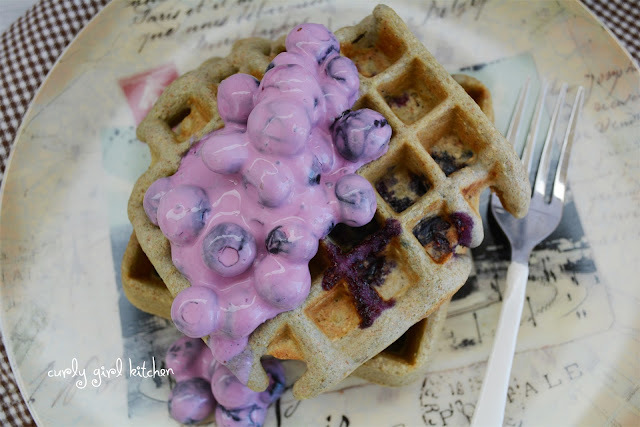 Freeze leftovers in individual zip-lock bags, and toast the frozen waffles for breakfast later.